Although too young to be a signatory of their 1948 Refus global manifesto, Lise Gervais was an ardent devotee of the Automatists. This group’s expressive and instinctive use of brush-strokes especially appealed to her personal affinity for texture and materiality. This 1975 oil on canvas is a fine example of this kind of experimentation. Her swathes of colour - black, white, saffron and burgundy - are carefully constructed using a palette knife and in many places reveal the texture of the canvas. 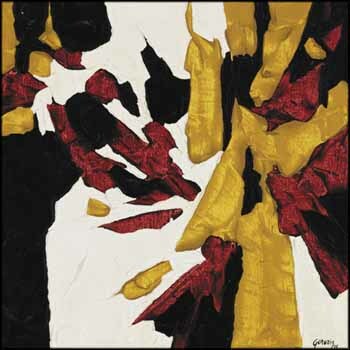 Gervais manipulates these vibrant colours expertly in smooth impastos to create a highly dynamic composition. Gestural sweeps of red, yellow and black radiate from an off-centre point, as if erupting from the canvas, and the brilliant white planes bring the whole composition together. Gervais’s rapid ascent in the Canadian art scene led her to teaching positions at Montreal’s École des beaux-arts, Concordia University and l'Université du Québec à Montreal. Examples of her work can be found in the collections of major institutions such as the Montreal Museum of Fine Arts, the National Gallery of Canada and the University of Toronto.